l . Adults and children weighing 50 kg and more: 1000 IU is administered, and in the case of a long hospital stay the dose (1000 IU) is repeated every 3-4 weeks. 2. Medical personnel: 1000 IU as soon as possible, however within max. 48 hours after exposure to 1-1BV and another dose of 1000 IU after 4 weeks, provided that a series of vaccinations against Hepatitis B has not already been staffed. 3. Sexual partners of patients with acute Hepatitis B: 1000 IU as soon as possible, within max. 14 days after occurrence of Hepatitis B in the partner, and another dose of 1000 IU after 4 weeks, provided that a series of vaccinations against Hepatitis B has not already been started. In such situations, vaccination against Hepatitis B is highly recommended. The first dose of the vaccine can be administered on the same day as human immunoglobulin against Hepatitis B however in different sites. If contraindications for intramuscular injections exist (coagulation impairment), the product can be administered subcutaneously, provided that no product for intravenous administration is available. It should be noted, however, that no clinical data about efficiency of subcutaneous administration of GAMMA anty-HBs 1000 is available. –	known hypersensitivity to any of the product components. GAMMA anty-HBs 1000 must not be administered intravenously. Make sure GAMMA anty-HBs 1000 is not administered directly to a blood vessel due to the risk of shock. If the recipient carries HBsAg, product administration does not produce any benefits. Sometimes, human immunoglobulin against Hepatitis B evokes a drop in blood pressure combined with anaphylactic reactions, even in the case of patients who tolerated previous treatment with human immunoglobulin. In the case of suspected allergic or anaphylactic reaction, product injection should be discontinued immediately. In the case of shock, a standard medical procedure should be followed. –	selection of donors based on clinical anamnesis and testing of both, a single plasma unit and pooled plasma for the presence of HBsAg, anti-HIV and anti-HCV antibodies. –	testing of pooled plasma for the presence of the genetic material from the virus of hepatitis type C (HCV). –	applied inactivation/elimination of viruses in the manufacturing process, validated using model viruses. Undertaken safety measures which are considered as efficient apply to enveloped viruses, such as: HIV, HBV and HCV. However, they can have a limited efficiency for non-enveloped viruses, such as virus of hepatitis type A (HAV) and/or parvovirus B19. Clinical data exists which confirms lack of transfer of hepatitis A virus (HAV) and B19 parvovirus during immunoglobulin use. Also, the presence of antibodies is presumed to play an important role for viral safety of the product. It is recommended, for patient’s safety, as far as possible, to record the name and lot number of the Gamma anty-HBs 1000 product together with the patient data after each application of the medicine, in order to correlate the product lot number to a given patient. Administration of immunoglobulin may disturb the development of immune response to vaccines containing live attenuated viruses, such as rubella, mumps, measles or chicken pox for a period of 3 months. The administration of Gamma anty-HBs 1000 should be followed by at least a 3-month pause before the administration of a vaccine containing live attenuated viruses. Human immunoglobulin against Hepatitis B should be administered three to four weeks following administration of a vaccine containing live attenuated viruses; if administration of immunoglobulin against Hepatitis B is vital in the period of three to four weeks after vaccination, another vaccine should be administered three months after administration of immunoglobulin against Hepatitis B. Passive transfer of antibodies against antigens of erythrocytes, e.g. A, B, D, may impair the results of some serological tests for the presence of antibodies reacting with red blood cells, e.g. direct antiglobulin test (Coombs test). The product can be used by pregnant women. The product can be used by breast-feeding women. Gamma anty-HBs 1000 has no effects on the ability to drive or use machines. 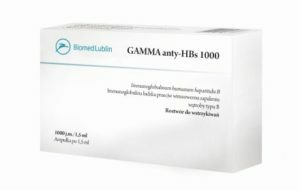 Like all medicines, Gamma anty-HBs 1000 can cause adverse reactions.